Happy Pi Day! Yin and Yang, and Sacred Geometry at Unity! On your last visit to Unity Church Hill Nursery, you probably have seen the circular terraces that are close to the south side of our building, at the top of the nursery display. A bird’s-eye view of this feature reveals it to be a yin-yang shape—two inter-locking pieces that fit into a full circle. 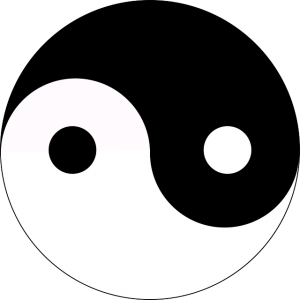 The yin-yang symbol comes from Chinese philosophy. It reminds us that things that seem to be opposite are in fact complementary and even interdependent. Thus the black and white lock into each other within the circle, and a spot of each appears in the opposite’s larger shape. Yin is the black side; yang is the white. They fade into each other like day fades into night. There are many profound ways to describe this philosophy—more than we can put in single blog post! “Sacred Geometry” refers to the shapes, patterns, and numbers that repeat in nature and which can symbolize key tenets of philosophy, religion, or spirituality. The yin-yang symbol appears in a circle and represents the unity of darkness/lightness, fire/water, expansion/retraction, and other dualities. It appears in a circle, which carries its own meanings in nature and in religion. Today, 3/14, is Pi Day. Pi is the ratio between a circle’s circumference and its diameter , always 3.14 (and many more digits beyond the decimal point). It’s an incredibly important number to the field of mathematics. At Unity, we have our own “Sacred Geometry” feature. 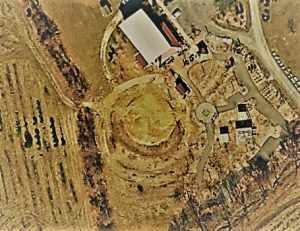 This aerial photograph is from the early construction of this exhibit: you can see the circle and the yin-yang etched into the soil. Now, the yin and yang pieces are raised above the surface, surrounded by semi-circular terraces. We’re gearing up for Spring at the nursery, and the farmers will plant the terraces with broccoli, carrots, potatoes, melons, and more! There is no Pi Day without PIE! Check out our new Farm Notes blog, and get one of Theresa’s favorite recipes for sweet potato pie!